Most of the time the 42-year-old computer specialist works in an office by himself, but the day he suffered a stroke, he just happened to be working with some other engineers responding on a call to fix a printer. Kyle Everett of Belton, TX suddenly fell out of his chair and started convulsing. His coworkers called 9-1-1 and immediately notified his wife, Rhonda. Rhonda works as an overnight pharmacist and was awakened from resting and immediately rushed to the Scott & White Memorial Hospital, now a part of Baylor Scott & White Health. There she found Kyle in the emergency room, completely unresponsive. He had suffered a large stroke, or a sudden death of brain cells due to lack of oxygen. The physicians were trying to diagnose him properly and were unsure if they should administer the tissue plasminogen activator (tPA) to break down blood clots because the CT scan did not show any abnormalities. This decision would either save his life or end it. Call it a miracle or coincidence, but newly hired vascular neurologist Jennifer E. Rasmussen, MD was finishing her shift and decided to respond to the call to see Kyle in the ER. She had just finished a fellowship in neurology, and it was her first day on the job. Dr. Rasmussen took one look at Kyle and immediately ordered for the tPA to be given. Time is of the essence in stroke care. Every minute can be death to more tissue, affecting parts of the brain and overall quality of life. Within the hour of the tPA, Kyle was able to move his right leg slightly. This gave enough hope to push on through the grueling week still ahead in the ICU. Kyle was fairly young when suffering a stroke, and due to his young age the brain did not have much area to swell. For older patients, atrophy can cause the brain to shrink slightly, lessening the damage because the brain has room to swell. It is vital to control this aspect after a stroke to prevent death. The Everetts counseled with Dr. Rasmussen who suggested they remove part of the skull to preserve Kyle’s chances. Although surgeons were unsure at first, Rasmussen’s expertise and knowledge of craniectomy proved beneficial. Following Kyle’s surgery it was a patient guessing game of charades. Rhonda recalls one time he wanted his reading glasses and it took about 30 minutes until they figured it out. The stroke had primarily affected the part of his brain controlling communication. All of Kyle’s memories remained intact and mentally he is “all there.” However, his right arm had difficulty moving at first, and he wasn’t able to work the remote on the TV in the hospital. Although he would get frustrated, Kyle did not pitch any temper tantrums. In fact, Rhonda and her two sons are grateful for this intervention of sorts to help them draw closer to God and to each other. They give thanks for the support of their church family and others who have shown care and concern. Nearly a year later, Kyle has great depth perception now, he can drive and his communication is getting better with short phrases. He is improving his speech through specialized therapy in Austin. 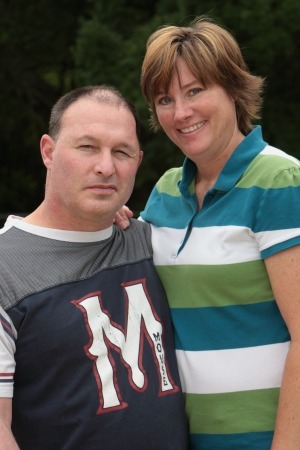 Kyle and Rhonda will celebrate their 25th wedding anniversary this August. Take our stroke risk assessment to find out if you are at risk for stroke.